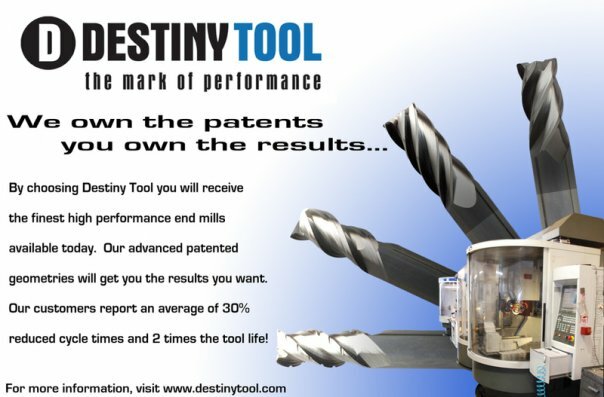 At Destiny Tool we WANT you to test our tools! When customers test our tools we want to insure that it's the right tool for the right application. We DO NOT give away free tools for testing. We recognize that many end mill manufacturers do indeed give away tools to 'test'. We are not one of them. All of our production and quality control teams take great pride to insure that every tool is made to our very high standards and we are all very confident that the tools will work. We've been doing it long enough to know that, in most cases, we are getting 2-3 times the tool life and at least double the chip load and double the depth of cut when compared to most all of our competitors. At the end of the day, the company that has the most parts and the biggest filled chip bins wins. We have priced out tools to be competitive with many of the commodity end mill manufacturers because, frankly, we make a fair margin and want to support the manufacturing base in our economy. We could charge more based upon the performance data but we don't. We want you to be successful. That's why we have a very strong trial policy. Our tools are designed to be run at elevated feed rates to to take advantage of our geometry. The biggest problem we have face is customers running them TOO SLOW or at to light of a chip load. That is why we love testing. Below is our test tool policy and also how you CAN get FREE tools. All test tool MUST be ordered under a GUARANTEED TRIAL ORDER. Test Tool orders MUST be placed through an authorized industrial distributor or machine tool dealer. We support our channel partners and sell exclusively through them. All test orders must clearly state “Test Order” “Guaranteed Trial Order” or “GTO” or any other indication included within the various order entry software commonly used by industrial distributors. This designation must appear ON THE FRONT of the Purchase Order and/or within the purchase order number itself. The order must show end-user customers name in the notation and/or in the drop ship special instructions. Full credit for tools for failed tests will only be given upon: (A) The receipt of a written request (RGA) accompanied by (B) A valid & completed test report and (C) The broken tool(s). This test report must explain all cutting conditions as well as mode of failure. Credit WILL NOT be given for outbound freight. Test Tools are assumed to be successful until such time as the items listed in #5 above are returned. Credit WILL be issued for orders and direct shipping both to and from end-user, or distributor, for failed test tools that comply with all of the above. Tools over 3/4" Diameter are not available with this program unless prior management permission is given. All Shipping charges are at the responsibility and expense of the authorized distributor. Would you like to get FREE Destiny Tool tools? We have a pretty rigid test tool policy as you can see on the left. But, we recognize that we operate in a very small industry. "Trust", "Loyalty" and "Partnership" are not words from a bygone era but something we strongly believe in and support. Our products are designed to fill a very specific niche of material applications. We believe and value "word of mouth" marketing. To get FREE TOOLS from us is really rather simple! Submit your report of SUCCESSFUL tests to us! Provide Destiny Tool with video and/or 5-10 pictures which can be used for our Blog and Social Media marketing. We will provide full attribution to you company as well! The test tools will be credited NO CHARGE to the GTO and shipping charges will also be credited. Upload a video with the successful test information (speeds, feeds, material,etc) to your YouTube or Vimeo account. If the video is of usable quality (no swearing :-) and send it us the raw video for our YouTube channel. *We may contact you for clarification in preparation of the posting. The tools aren't cheap but I don't know anything else that can sustain a .012 chip load per tooth. 288 ipm at 8K rpm. 40.4 cubes with a 1/2" tool.. that's scootin right along." "I switched over to the Destiny Viper 3 flute mills about 2 months ago and they are AWSOME! On Friday I was running a half inch one at 7500 RPM full slotting width .55" DOC at 105IPM and it was happy as can be. I was running flood to help get the chips out."